LEXINGTON, Mass.--(BUSINESS WIRE)--Vistaprint is launching a new, multi-million dollar TV advertising campaign this week, signaling a fresh, brand-forward direction in the company’s marketing strategy. Unlike previous Vistaprint commercials that have traditionally been geared towards direct response, this new spot is the first in the company’s history that will not include messaging around offers or discounts. 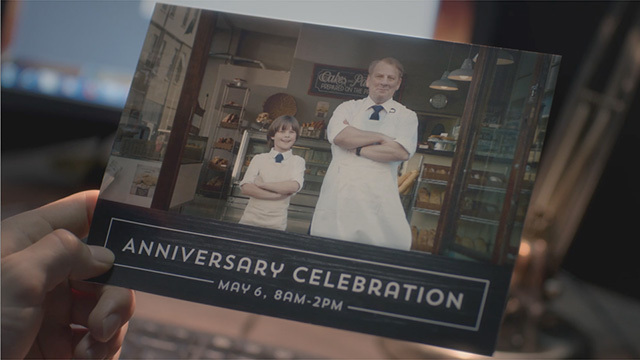 Directed by international award-winner Greg Gray, the spot, entitled “The Postcard” tells the dramatic and touching story of a family-owned bakery through the interactions and relationship between the owner and his son over a period of fifteen years. Vistaprint products are used throughout the piece as a plot device to drive the narrative and show how the business is evolving over time. The story is set to an original song titled “Hold on Tight” composed by Verité Music. The spot ends with the tagline, “Everything you create matters,” recognizing Vistaprint’s emphasis on providing professional quality products that micro businesses can use to market themselves with pride. The aim of the campaign is to elevate brand perception and foster a higher emotional connection with customers, while communicating both the quality and depth of its range of affordable, customizable printed marketing products for micro businesses at any stage. As the leading e-commerce company serving micro business owners with Do it Yourself marketing materials, Vistaprint expects the commercial to help grow its share in this $30 billion industry. Don LeBlanc, Vistaprint CMO, comments, “Our new commercial is a very different direction for Vistaprint and we are excited to share it with our customers, who are the inspiration behind the story. The launch of this spot represents the next major step in what has been a three-year process of repositioning the Vistaprint brand and refining our organization’s culture towards a higher level of customer-centricity. The creative was developed in-house by Vistaprint’s own internal agency, which comprises over 120 employees working from locations in the US, Europe and Tunisia. The 30 and 60-second versions of the commercial will air on TV in the US over 8,000 times in February and frequently throughout 2015. A full three minute version, where the complete story is revealed, is available to view on the Vistaprint YouTube channel and widely distributed online. Media buying is being coordinated by Havas Edge. Liam Shannon, Executive Creative Director, Vistaprint, comments, "Micro business owners are at the heart of Vistaprint, which was itself created 20 years ago specifically to suit their needs. Each of them is highly individual. But when you know them as well as we do, you see they share a key attribute. They are their business. And their businesses are them. "As a result, when we set out to express the essence of the Vistaprint brand in this ad, we knew we had to capture the essence of the small business owner, and that meant we had to tell a tale that was both completely business and completely personal. And so ‘The Postcard’ was born. It pays homage to the small business owners that inspire us every day." The first airing of the TV commercial marks the start of a wider brand marketing campaign in North America, which will live across several touch points including display advertising, social media, content marketing and PR. Localized versions of the campaign are set to roll out in Europe later in the year. Vistaprint will continue to air its previously successful testimonial-based commercials throughout 2015. Vistaprint is a global e-commerce brand empowering more than 16 million micro business owners to professionally promote their business with quality printed and digital marketing products at an affordable price. Our world-class online design studio allows customers to easily customize their products including business cards, marketing materials, signage, promotional products, apparel, websites, digital marketing, cards and stationery at www.vistaprint.com. Our patented printing technique allows us to maximize efficiency and consistently deliver quality and value to customers. This innovative process is supported by 25 localized websites serving various global markets; world-class manufacturing facilities around the globe, including North America, Western Europe, Australia and India; and thousands of employees in offices worldwide. Vistaprint is a Cimpress (Nasdaq: CMPR) brand.